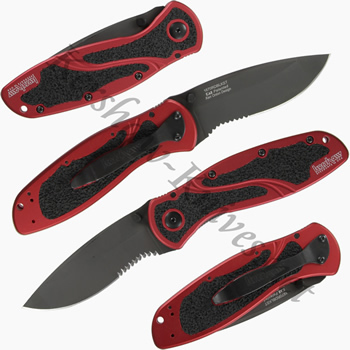 The Kershaw Blur 1670RDBLKST has a black partially serrated black and a red aluiminum handle. Trac-tec inserts are inside the handle to give it nice grip and good looks. This made in USA knife has an assisted opening system that can be realized when you press on the contoured ambidextrous thumbstuds. One thing so classy about this knife is those contoured thumbstuds. They are so comfortable and allow you to effortlessly deploy this blade. Is the Kershaw 1670RDBLKST worth of being your edc? Yes, by a long shot.